This is one of my most used apps among all apps on my iPhone, even including the stock apps. It probably ranks up there with text messaging for me. I used to really love Tweetie until the update to Tweetie 2 where some of my favorite features were removed. So I started to look around and then I found Twitterrific. There is a free version that is ad supported so check it out first to see if you like it before buying. So there’s a lot I like about this app and a few things I don’t. I’ll start with the good. First, it’s beautiful. There’s a pretty good reason for this and it’s because it’s designers are the iconfactory. They are first, an icon design company and now develop iPhone apps. They’ve designed icons for Microsoft Vista and XP, Xbox, Ubuntu, Red Hat Linux, Macromedia, and even Walmart. The app flows really well through menus and it’s very intuitive. It really is my favorite twitter app right now but I do have some things I’d like to see change or added. • When tweeting and wanting to @reply someone there needs to be an easy way quickly enter in someone’s username but just typing the @ and the first couple letters of the username. Right now you have to scroll through the list of people. • Right now when you search for something and then want to reply you have to choose what twitter account you want to use. The searches should be accessed from withing each account, not the main menu. That way you can create custom searches for each account and you’re not limited to 3 choices of accounts when responding. During the WWDC last week, Apple gave out awards to the best deigned iPhone Applications. There were five categories; Best iPhone Game, Best iPhone Healthcare & Fitness Application, Best iPhone Social Networking Application, Best iPhone Entertainment Application and Best iPhone Productivity Application. Below are the results and I will have to agree with Apple…all these applications look aweseome! 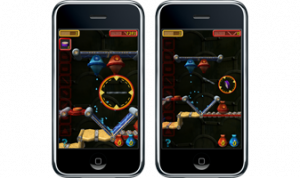 Enigmo 1.0 – Pangea Software, Inc.
Enigmo for iPhone is a 3D puzzle game where players construct mechanisms to direct lasers, plasma, and water to toggle switches, deactivate force-fields, and eventually get them to their final destination. 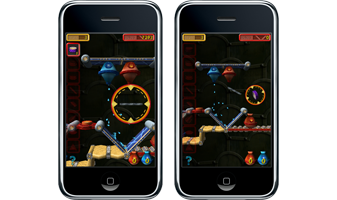 Originally the most unique game that Pangea Software ever created on Mac OS X, the new iPhone version brings the concept to a whole new dimension by taking full advantage of iPhone’s Multi-Touch interface for dragging and manipulating puzzle pieces, zooming in and out, and operating game controls. With gorgeous 3D scenes rendered with OpenGL ES and amazing 3D audio produced by Open AL, Enigmo 1.0 for iPhone delivers a phenomenally engaging and addictive game play experience to iPhone and iPod touch.